AP Primary English Medium School Teachers Selection of District Resource persons (DRPs) as per Lr.Rc.No:254/AP Orientation Primary English Medium School Teachers Selection of District Resource persons (DRPs) as per Lr.Rc.No:254. 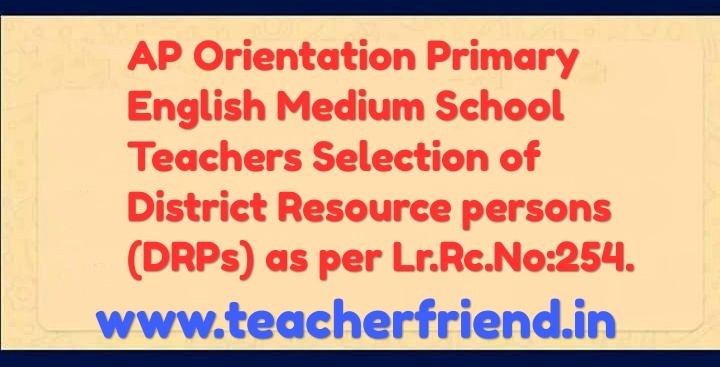 AP School Education SCERT - Primary English Medium Schools -Orientation Primary' English Medium School Teachers Selection of District Resource persons - Order issued as per L.r. Rc. No.254/11 /1F/SCSRS Dated: 31-07-2018. AP Orientation Primary English Medium School Teachers Selection of District Resource persons (DRPs) as per Lr.Rc.No:254. Note orders of CSE. AP Rc. No. 254/13/TE/SCER172018 di: 10.07.2018. All the District Educational Officers in the State are beret') informed that Government of Andhra Pradesh estahlished English Medium Primers Schools across the State form the Academic sear 2018 - 19. In this connection SCERT is decided to conduct Orientation 10 the teachers who arc working in English Medium Primary Schtmls to enhance Teaching skills and Tap the built in resources to teach Maths and INS through English Medium. In the above context all the District Educational officers are requested to identify twenty 1201 District level resource persons for conduct of English Medium Primary school training in their respective District. 'The list of Resource Persons should he send this office on or before 03-0X-2018.The following factors ma) taken into consideration while selection of District resource persons. RIO / 01:1.11/ CTE PGCTE / MUTE Trained Teachers. Willing to participate and to act as resource persist.